2006 marked a very important year for the Halloween Haunt. As we have seen through the years in this section of the website, we have seen that beginning from year one, Knott’s released maze themes that were originally written by employees of the park. 2006 was the first year in Halloween Haunt history that a maze theme was based/released exclusively on a movie theme and in fact, the world premiere of the movie took place at a special event at Halloween Haunt. The maze was the Grudge 2 and it was a huge success for the event. 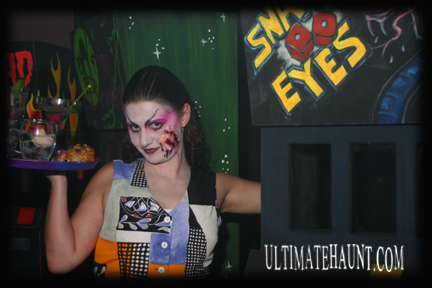 The fans of Ultimatehaunt.com voted the Grudge 2 maze as the fan vote for Maze of the Year. There is a complete tribute to this incredible maze on the website and you can view it by clicking here. What else did the park have to offer in the year 2006? Knott’s brought in another new maze named “Lost Vegas”, which as a good-gone-bad theme was certainly not the best the event has offered guests. Be that as it may, it was entertaining for many. Will it return for another year? Well, probably, but perhaps it will be fine-tuned a bit to have a little more impact.